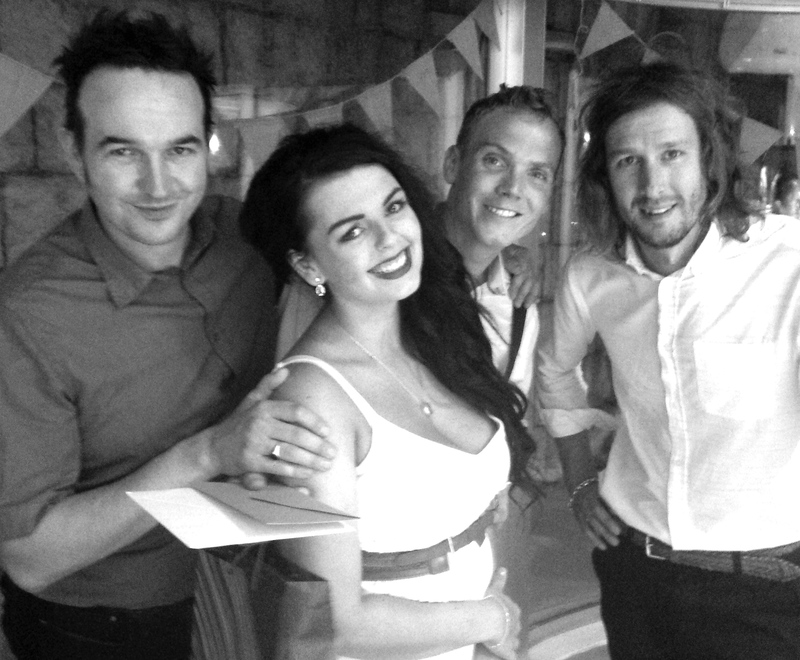 If there’s one thing we’ve learned as a wedding band; life is certainly never dull! 2015 saw us perform a diary-busting 75 weddings, zooming off in all directions of the United Kingdom. Marriage is most definitely soaring in its popularity and with this, the demand for couples to think outside the box when putting their own stamp on their big day. The desire for complete originality has resulted in a new trend which has seen Rock My Reception pack our bags/instruments and hit the skies for the ultimate wedding experience: the Destination Wedding. Last Wednesday we flew out to Croatia, to the Old Town area of Dubrovnik, to provide the sound track to the day for Natasha and Brett, the new Mr and Mrs Ince. We offered to play stripped back… purely acoustic, adding to the vibe of the day, which was laid back, relaxed with a real summery feel. Planning a wedding anywhere in the world can be a stressful experience, but Natasha and Brett were fortunate to instruct Iva Hrdlicka from dubrovnikevent.com one of Croatia’s top Events Designers to help plan the day. We liaised with Iva over email and the phone. The simplicity of our acoustic package meant we could fulfil the needs of our bride and groom- to be ‘on hand’ all day, providing live music at any point, either indoors or outside. Iva was fantastic at precision planning the logistics for the day and gave us complete confidence to know the proceedings would run smoothly, providing us with accurate details in the lead up to the wedding, when we were over 1500 miles away. We arrived in Dubrovnic the day before the wedding, giving us the chance to immediately make a reconnaissance of the venue. 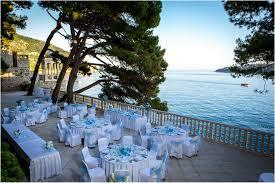 It became easy to see why Natasha and Brett chose Dubrovnik for their wedding location. As the temperature soared to 30 degrees, we got see the town in all its splendour. A short walk from the venue we headed down the narrow streets towards the pedestrianised Stradun where the pavements shone bright in the sun, polished to a smooth finish from the constant movement of the many tourists. A joyous vibrancy of all kinds of art forms and culture met you at every turn, from art galleries and museums to open air music and theatre. 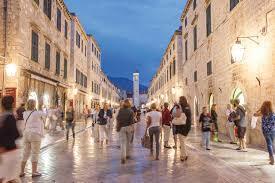 The streets were lined with shops and restaurants, architecture, a mix of Renaissance and Baroque. The jewel of the town though was without doubt was Sponza Palace, where we were to be performing during the wedding ceremony. Come the big day we made our way to the open air hall of Sponza Palace for the ceremony. We had been asked to accompany one of Natasha’s friends, Carly, in a rendition of ‘This Is Us’ by Keisha Cole. With a quick rehearsal in one of the Palaces side rooms, we had the song in the bag with no problems. We accompanied a local pianist and cellist for the Brides entrance song. The ceremony couldn’t have been more perfect. Natasha looked stunning in her dress and a beautiful reading from Natasha’s sister, Lexi: a lovely touch to the ceremony. For the recessional piece Natasha had asked us to perform ‘Adorn You’ by Miguel. We took requests and chatted to the guests during the drinks reception in the open air courtyard of the palace, the acoustic guitars and vocals echoing off the limestone walls into the open warm air above us, setting the tone for the day. We followed the wedding party through the picturesque streets as the sun blazed down from the glorious blue sky. We boarded the boat which was to take guests on a cruise of the Dubrovnik coastline. 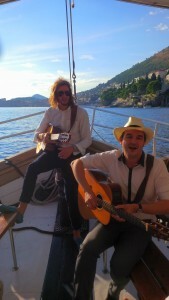 Positioning ourselves at the bow of the boat we did suddenly feel ourselves reminiscent of Duran Duran’s ‘Rio’ video! There are certain stand out moments which occur in your life and this, for us, was certainly one of those: taking requests from a bride and groom and their guests, playing on board a boat sailing on the clear blue Adriatic Sea. As we past the picturesque coves and beeches, the music and atmosphere carried across the water as sun bathers and tourists clapped and cheered the newly weds as we passed by. The evening reception was held at the Grand Villa Argentina, a Twentieth century mansion, positioned on the edge of the cliff overlooking the Adriatic. We played in the garden alongside the private beech and saltwater pool for the Champagne welcome drinks. As the sun set in the West over the sea, the newly weds were showered in confetti as we the guests joined in our acoustic version of Teenage Wedding by Chuck Berry. Iva, Marin and the staff at the Grand Villa Argentina were incredibly friendly and helpful, guiding us to where we would need to be for the various parts of the proceedings for the commencing evening reception. As Natasha and Brett where welcomed into the room for the evening, we followed them in playing ‘All You Need Is Love’ as they took to there seats. The speeches followed and on to the wedding meal. After the meal and toasts Natasha had a surprise for all the guests. The lyrics to Queens Bohemien Rhapsody were handed out to everyone, we had been previously briefed to play along with the track as all the guests stood up on there seats for a sing along, climaxing in an air guitar solo by all the groomsmen! The staff and waiters all spontaneously joined in… an absolutely fantastic way to end our day. 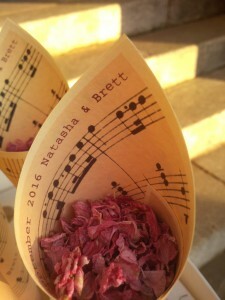 It was a joyous experience to play for Natasha and Brett. Not only was it a pleasure for us to perform at one of the most stunningly beautiful locations, but the whole party embraced the day with such gusto. 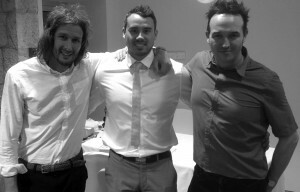 Pictured with the happy couple! We would like to take this opportunity to thank Brett and Natasha for booking Rock My Reception for their wedding and wish them both a long and very happy future together.